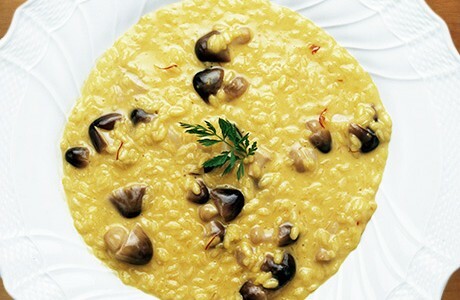 Risotto is a staple of Italian cooking and this quick and easy recipe with mushrooms is a delicious version of the classic Italian dish. Sauté one finely chopped medium onion and the mushrooms in 40 g of butter until softened. Add 340 g of Risotto rice and coat until translucent. Add one glass of dry white wine, and cook until evaporated. Add 1l hot chicken or vegetable stock and simmer, stirring occasionally. After 14 minutes the stock will have been absorbed, the rice will be cooked and creamy, yet retaining a desired bite in the centre. For less 'al dente' consistency add a ladleful of the hot stock and simmer until absorbed, continue in this way until the rice has reached the desired consistency. Stir through grated Parmesan cheese and serve.